This past April, many DDAF supporters, fans and friends gathered in Carmel, California, to celebrate Doris Day’s milestone 90th birthday. It was a remarkable weekend of festivities, culminating in a birthday gala ... and Doris surprised us all by attending the Friday night dinner in her honor! Some good friends of DDAF supplied entertainment and camera skills, and they have kindly donated their talents in creation of a very special 90th Birthday Gala DVD. With the final editing complete, we’re pleased to let you know, you can own this DVD for a minimum donation of $35 for domestic shipment or $45 for international shipment. You’ll enjoy highlights from the weekend’s events, a wonderful reprise of the gala, Doris’ appearance, clips from her career retrospective, and her fans’ joyful reception! 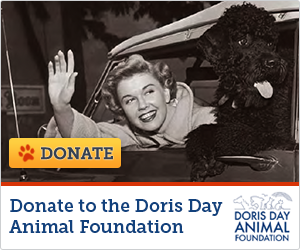 Click here to donate today and receive your copy of Doris’ 90th Birthday Gala DVD! DVDs will be shipped domestically within three weeks, internationally within five weeks. Please note for international orders: The 90th Birthday Gala DVD is encoded for use on U.S. DVD players. You should have no trouble playing it on any computer, but please be advised that it may not play on some international DVD players. You won’t want to miss out on this wonderful keepsake. And your donation, less the cost of the DVD itself and shipping, will go entirely to helping the four-leggers. Quantities are limited, so be sure to make your donation today! We know you’ll relish every moment of this very special video memento. Thank you in advance for your support. Yes, John, the DDAF informed me that it is $45 for Canada. Can.t wait to receive this wonderful keepsake, Ordered last week.